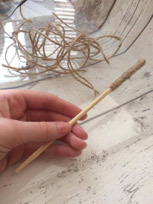 We are known for our quirky stationery at Ace Wedding Design and here we are going to show you how to make your own magic wand from items you probably have around the house! We would give this a skill level of 1 star – it’s easy! 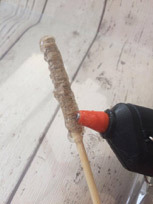 – we would say adult supervision is definitely required during the making process if making with young children due to the glue gun. Put a little glue on the top of one stick (the flat end not the tapered end!) and secure the end of the twine to the glue. 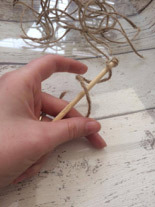 You are going to wrap the twine around the stick to make a handle, the length of twine you need will depend on the size of your chopstick! You should now have a handle for your wand! Yay! 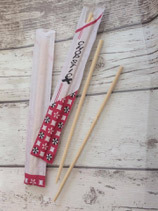 Make some lines on the other half of the chopstick with the glue – get creative! We went for a spiral all the way round. It should look something a bit like this! 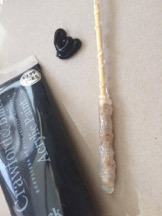 Paint the first undercoat of your wand, make sure you get in all the little cracks and cover the glue part well! When this is dry don’t forget to do a topcoat, as the glue needs to be covered well! Let’s make it look pretty! Use a small amount of your wax and brush over the top, we use a cloth because we think it makes it much more realistic. The idea is just to pick out the detail! Voila! 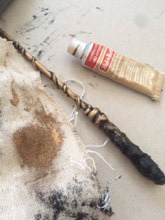 You made a wand! Now get creative with some awesome spells! 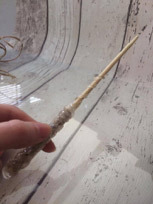 You can find these wands premade on our website soon! www.AceWeddingDesign.com they make great wedding favours for your guests! Ace Wedding Design aim to create a magical journey beyond belief with all aspects of your stationery! 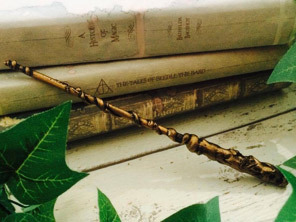 P.s if you make a wand show them off on our Facebook page!